Poaceae or Gramineae is a large and nearly ubiquitous family of monocotyledonous flowering plants known as grasses. Poaceae includes the cereal grasses, bamboos and the grasses of natural grassland and cultivated lawns (turf) and pasture. Grasses have stems that are hollow except at the nodes and narrow alternate leaves borne in two ranks. The lower part of each leaf encloses the stem, forming a leaf-sheath. With ca 780 genera and around 12,000 species, Poaceae are the fifth-largest plant family, following the Asteraceae, Orchidaceae, Fabaceae and Rubiaceae. 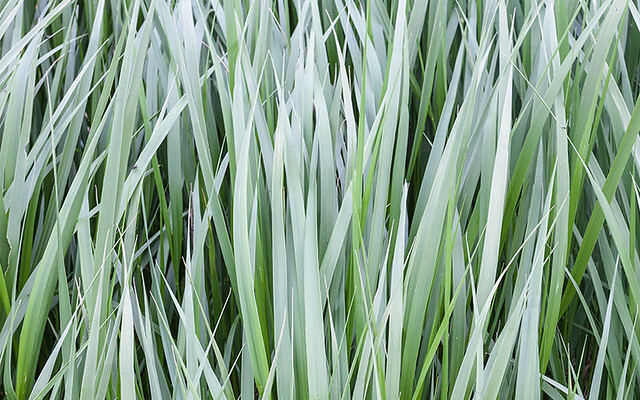 Though commonly called “grasses”, seagrasses, rushes, and sedges fall outside this family (see Grass (disambiguation)). The rushes and sedges are related to the Poaceae, being members of the order Poales, but the seagrasses are members of order Alismatales.